This is a rooting master for the unproduced 12" Princess Leia Bespin figure that was to be released with the Empire Strikes Back line. 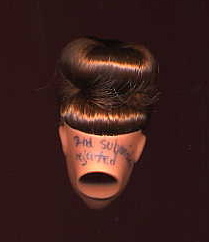 Similar to the Talking Yoda Doll Rooting Master, a piece like this is used to determine the placement of the threaded hair for production, a process that involves a high-speed needle stitching a hair pattern into a hollow rotocast head (usually performed by an underage worker in an Asian sweatshop using dangerous, high-speed stitching equipment). The Leia Bespin doll has a significantly different hairstyle than the Star Wars Princess Leia doll with classic Leia hair bun style. 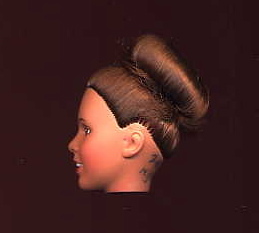 Note the tight rooting along the top of the forehead in contrast to the rooting down the middle on the original Leia doll. The hair is tied back into a single bun as Leia's hairstyle in the latter part of the Empire Strikes Back. 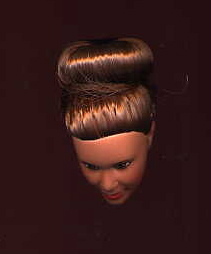 This rooting master does not contain the additional hair braids found on the production Leia Bespin doll. Similar to other rooting masters, this one is marked on the back, "2nd Submission Rejected". This particular design was not the actual ones used for the final rooting pattern.